I love bleached pinecones. 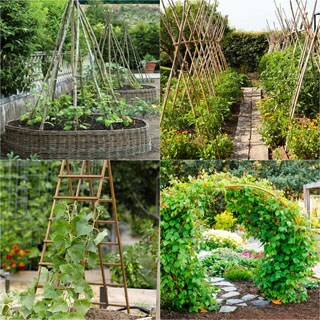 They look beautiful in almost any settings from farmhouse to modern. 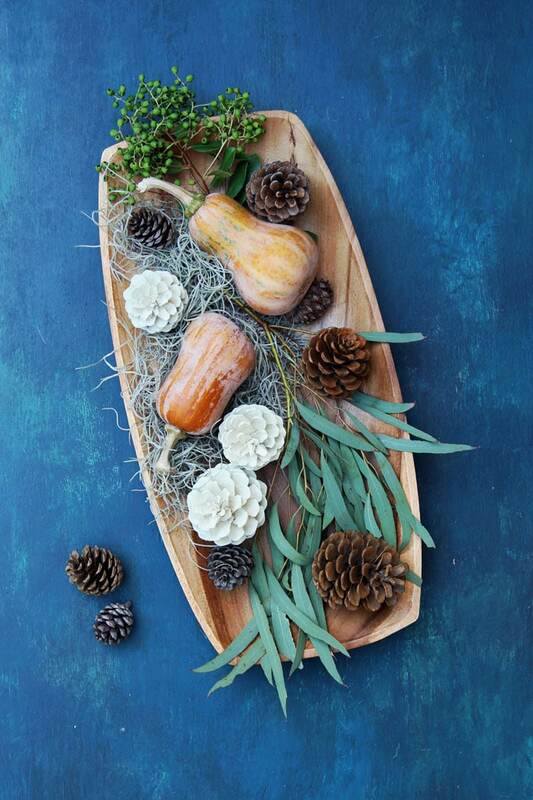 They are especially gorgeous additions to fall and winter decor, such as Thanksgiving and Christmas decorations. However, so many of us are sensitive to bleach. Exposure to bleach can irritate the eyes, nose, lungs, and skin. There might also be negative environmental impacts when we dispose bleach. Another challenge of bleaching pine cones is that you have to wait for a few days to let the pine cones soak in strong bleach, and let them dry. The results can vary quite a bit depending on the varieties of pine cones. So how do we make beautiful “bleached pinecones” without using bleach? After testing on a bunch of pine cones, I think I have found a really simple and easy way to make natural looking “bleached pine cones”. Ready for the secret? 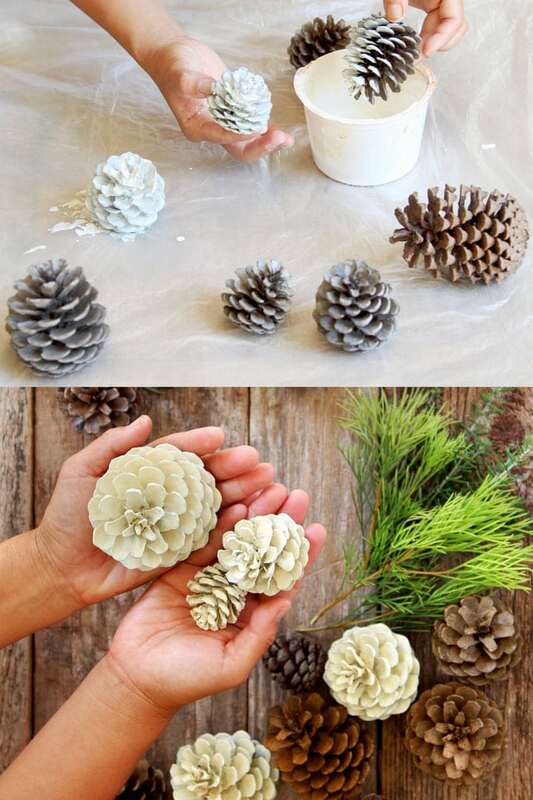 How to use whitewash to create bleached look on pine cones. In simple terms, whitewash is diluted white paint. It creates a soft look while still showing some natural variations and textures of wood, brick, or in this case, pinecones. 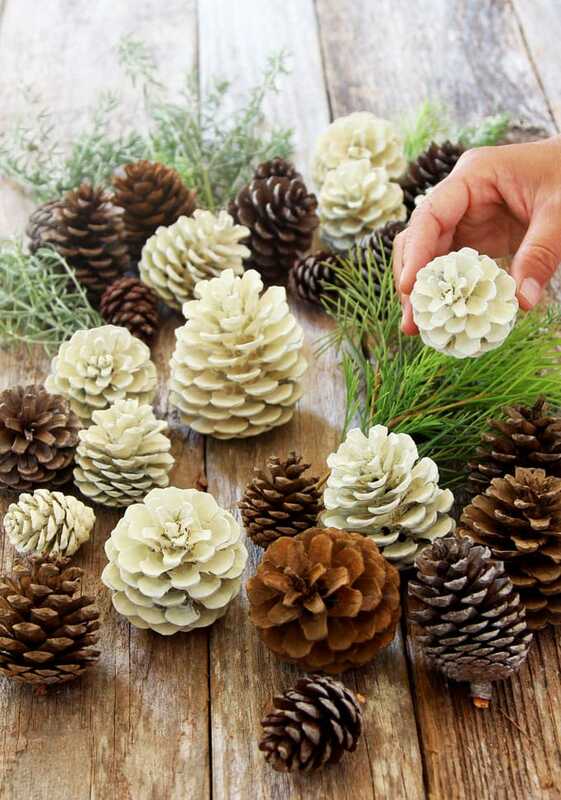 Although it is super quick and easy to whitewash pinecones, there are a few tips and tricks to make them look very natural, almost like real bleached pinecones (instead of painted white pinecones). I will share with you all the secrets in this tutorial! If you are interested in how to whitewash wood, here’s a detailed tutorial with 3 simple techniques. 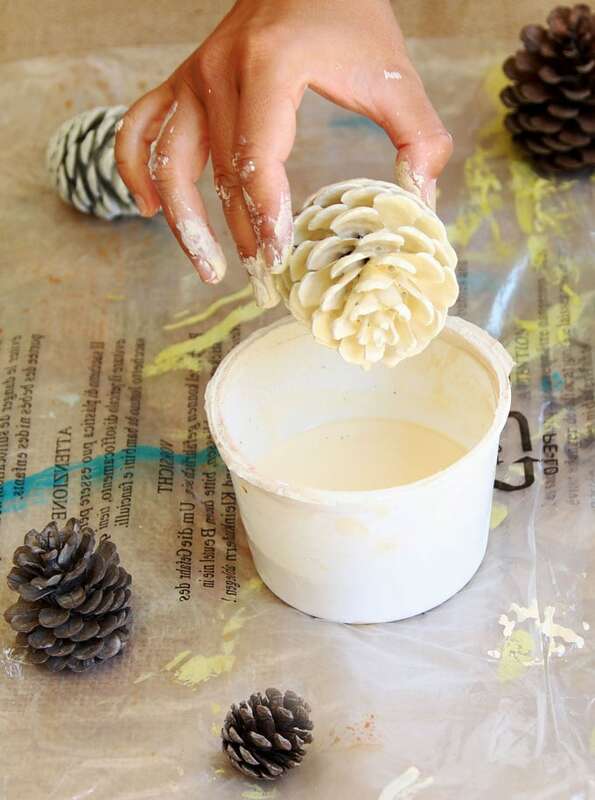 Materials and tools to make faux bleached pinecones. pinecones: after collecting some pinecones, dry brush them clean using an old tooth brush, or wash them and let dry. Some pine cones will close up after they get wet, and open again once they are dry, so plan ahead if you decide to wash them. non-toxic acrylic or craft paint: here’s one of the secrets: DecoArt brand “Buttermilk” paint color makes the pinecones look like bleached. Step 1: mix paint to whitewash pine cones. The paint color and consistency are keys to make the pinecones look like they are bleached pinecones instead of just painted white pinecones. This “Buttermilk” paint, as you can see, is not a pure white like white plastic container. Mix 1 part water with 1 to 2 parts paint depending on how thick the paint is. Experiment with a couple of pine cones first, you can wash them clean if you don’t like the consistency. I used 1 part water to 2 part paint ratio for this “Buttermilk” acylic paint. Related: Another great non-toxic pine cone decorations DIY- 3 minute DIY snow covered pine cones, branches, and berries in 3 easy ways, detailed tutorial here! 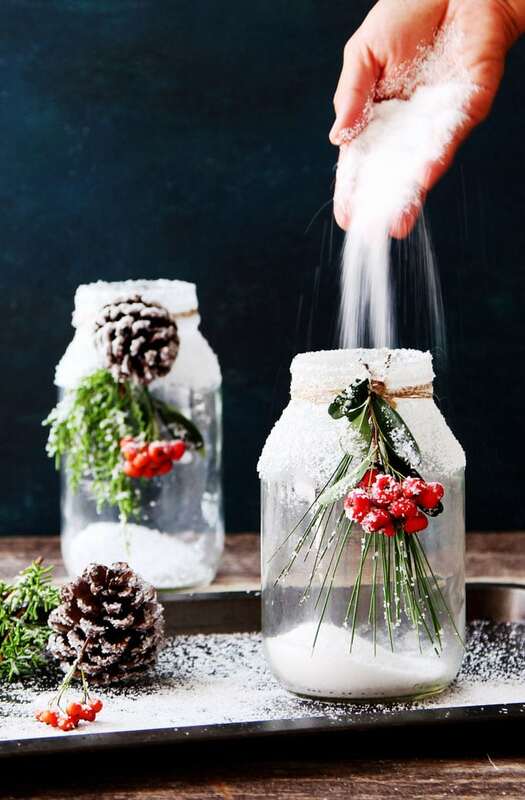 I used these DIY snow covered pine cones & branches in our enchanting snowy DIY mason jar centerpieces, tutorial here! Step 2: dip pinecones in whitewash paint. Wear gloves ( do what I say, not what I do…) and dip each pinecone in the diluted paint. Keep rotating the pinecone until it’s coated with whitewash in all the nooks and crannies. Lift the pine cone, let the excess paint drip off for 10-20 seconds, and put the pine cone on a sheet of plastic to dry. That’s it! 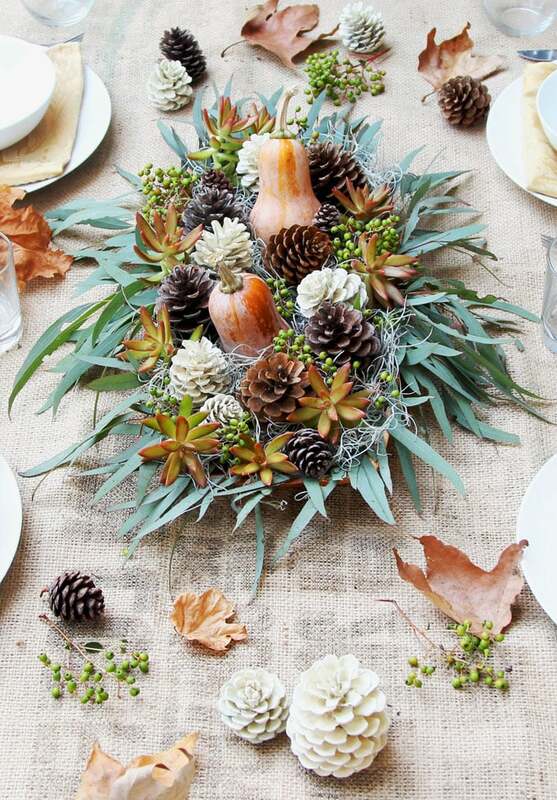 Now let’s look at some ideas on how to use our “bleached pinecones” in home decor. 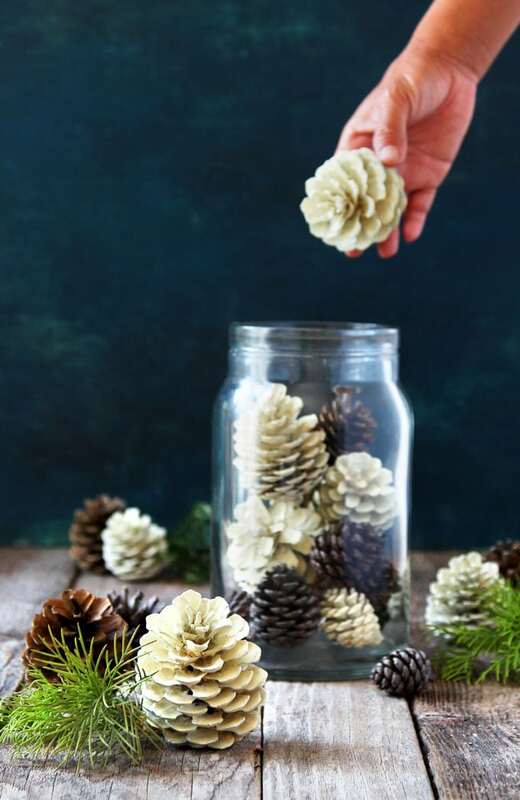 For an instant winter or Christmas decoration piece, place a mixture of natural and “bleached” pinecones in a glass jar. It would look beautiful on a table or a shelf. 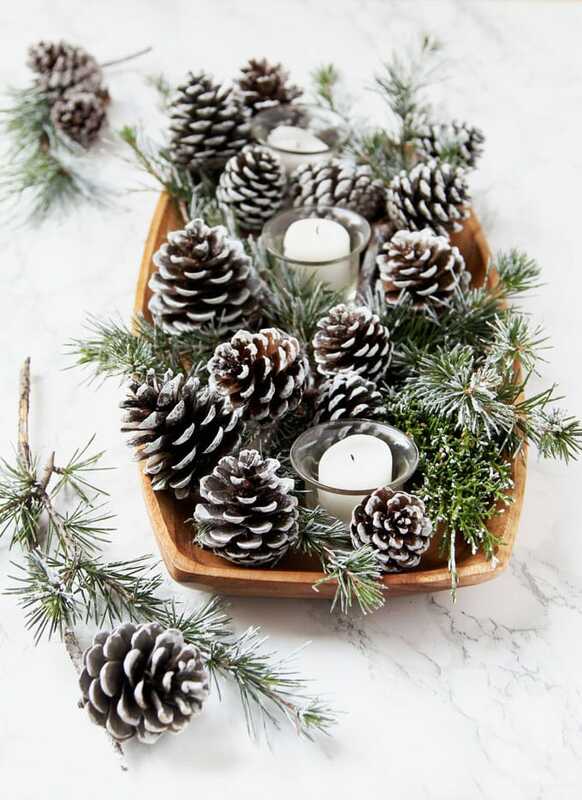 You can also put a mixture of whitewashed pinecones, moss, and other natural elements in a bowl or basket as table decorations. 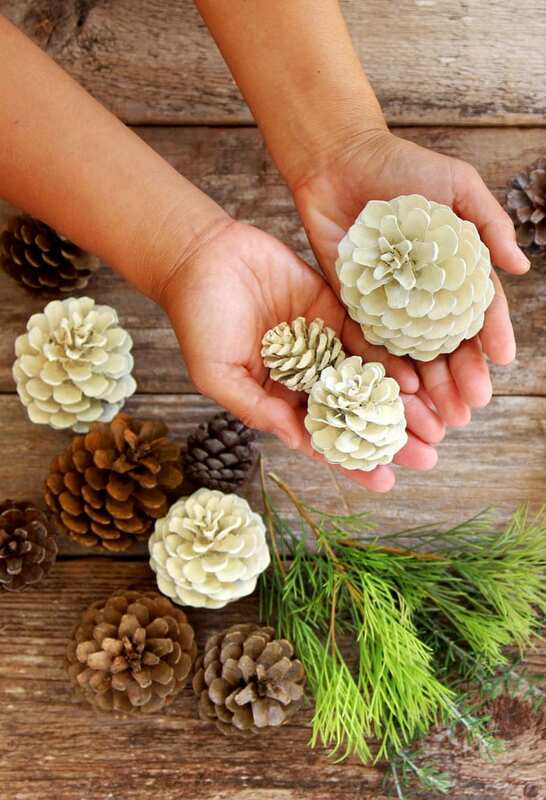 These soft white pine cones are gorgeous in DIY fall, winter, Thanksgiving, and Christmas centerpieces. 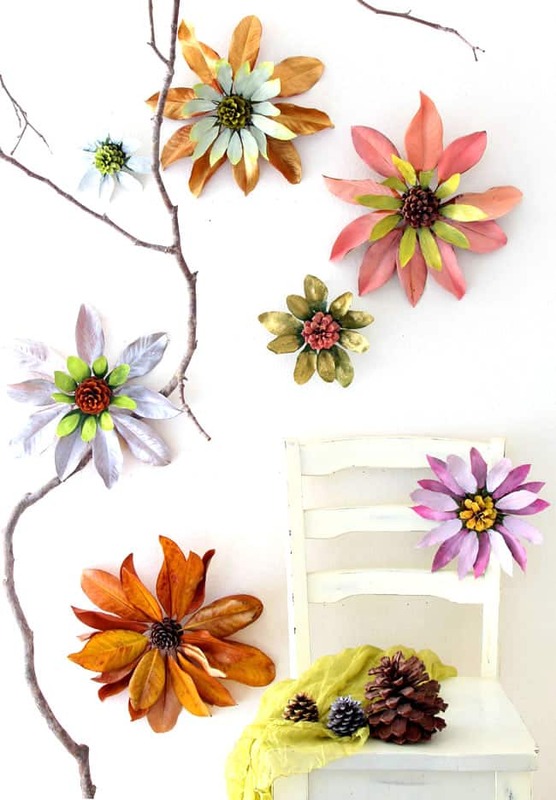 Check out the DIY 10 minute centerpiece tutorial here. 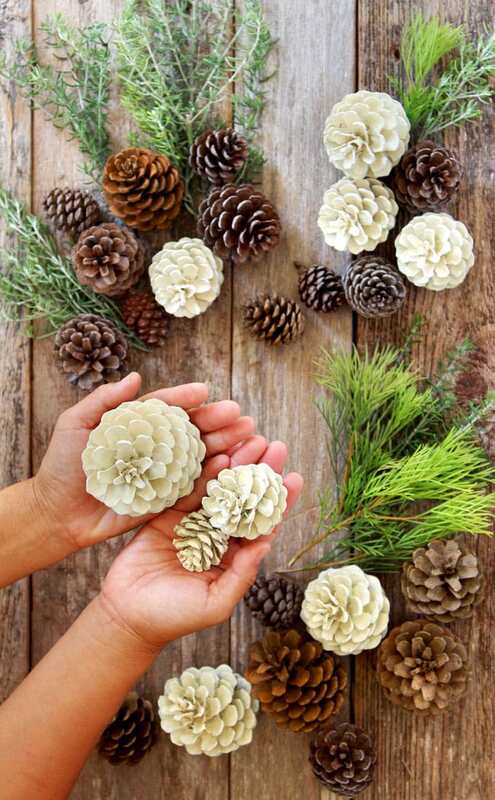 Love pine cone crafts and decor? 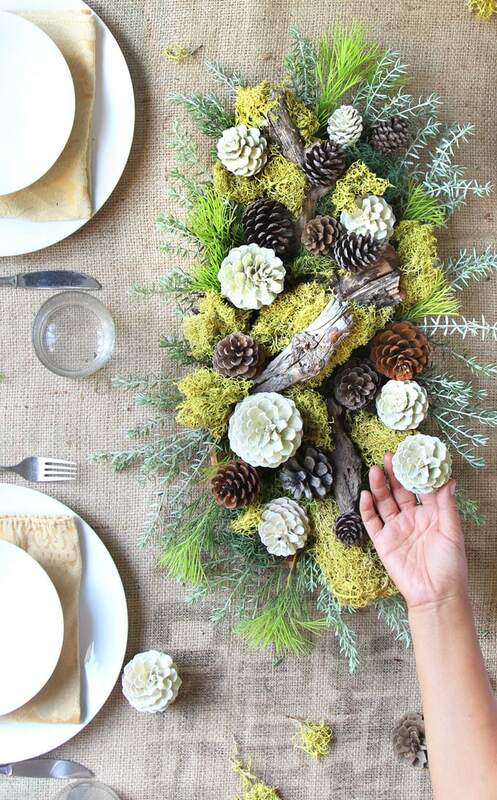 These DIY giant flowers with pine cones will make you feel like Alice in wonderland! Previous Post: « Create Your First Cricut Maker Project in 20 Minutes! What a great alternative to using bleach! I like this process so much better and they really do look bleached and not painted. I really love the centerpieces you put together using them, simply gorgeous! Ah these look so gorgeous! I love crafts and the these are perfect for fall and winter! These are great ideas. I can’t wait to try these out . I love the bleach pine cones. Beautiful! I absolutely hate pine cones. I guess because when we were young we had trees and had to clean them up every weekend . I went to an estate sale they had tons. The owners son hated them as well. When I went back to retrieve my items he had stashed a ton of them in my items!!! 😬 I always use a very few of them for Christmas. This game me life and an idea for Christmas. I have 2 huge glass vases and I’m going out into the flowerbed and grab some lambs ears. I don’t like them but this will be beautifully designed. Lol! Thanks for your inspiration. I may try a few other colors. OH.MY.LORD. Carlotta. I wish you were my neighbor. I MISS my lambs ear! What a beautiful arrangement that is going to make. MERRY CHRISTMAS! I was so inspired by the ‘bleached’ pine cones and the process you used to achieve them that I joined your blog & was able to explore even more of the wonderfully creative projects you’ve posted. Really looking forward to seeing more posts & exploring more areas of the posts you’ve already posted. WooHoo!!! Where did you get the paint ? Wish you had shown the bottle of paint ?? Love them.. I tried this method and once the pinecones closed, they did not reopen? Too much paint in my paint to water ratio? wow, great idea. got me thinking about maybe red ones with the white for a Christmas look. ( I am a ‘red’ person). the red wash 🙂 would be beautiful on pine cones! happy crafting! Love the ideas. Do you have any suggestions on how to remove stubborn resin from my NJ pine cones as water and brush do not work. WATCHING THIS GAVE Me A Wonderful IDEA We’re in our house 7yrs now .We never did A BACKSPLASH In Our KITCHEN BUT THE IDE A OF USING CARDBOARD. TO LOOK LIKE METAL IS Something I MIGHT Have TO TRY. I will definitely try it next time. Thank you for sharing! !